The following is a lightly edited transcript of a talk delivered at the David Horowitz Freedom Center on Nov. 19, 2017. Daniel Pipes: I'd like to start by recalling Lt. Hiroo Onoda of the Imperial Japanese Army. Lieutenant Onoda was, in 1974, convinced to surrender. He was living on an island in the Philippines, and for 29 years, he had very seriously been engaging in war. He'd been killing people, maiming them, and stealing. Finally, he was convinced, when his commanding officer came to the island, that he should lay down arms, that the war was over and that Japan had lost. I would suggest to you that in 1993, on the White House lawn, Yasser Arafat gave up the conflict with Israel and recognized Israel's right "to exist in peace and security." Of course, he didn't mean it, and it wasn't accepted by most Palestinians. Still, the Palestinians gave up those many years ago, making them now a larger version of Hiroo Onoda. They're continuing to fight, to maim, to kill, but they're not actually getting anywhere. 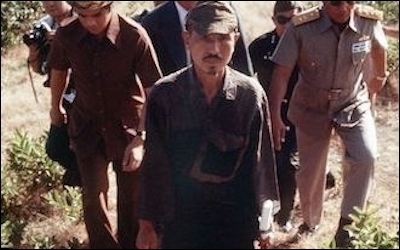 Lt. Hiroo Onoda walks out of the jungle on Lubang Island in March 1974, almost 29 years after the Japanese surrender. I'd like to suggest a new paradigm, putting the negotiating one completely to the side. It rejects the old idea of bringing Israelis and Palestinians together and, basically, the Israelis trying, or the Americans pushing the Israelis, to accommodate the Palestinians, who sit in judgment and say, "Well, no, 99½ percent isn't enough" or "100 percent isn't enough." Now, these words "victory" and "defeat" are not found in the modern American vocabulary. Rather, we hear of a "compromise," "painful concessions," "mediation," and the like. But, as Khaled pointed out, peace processes don't work. If you look at history (and I'm a historian), what ends conflicts is one side giving up. Now, think about it. If you and I are in a struggle, it's only going to end when one of us gives up, at which point it's over. Until one of us gives up, the conflict can resume. The Koreas could be at war today because neither side has given up. In World War I, the Germans lost, but didn't give up, so they gave it another try, and in World War II, the Allies forced them to give up; and note how much they benefited by giving up. So, victory is defined as imposing one's will on one's enemy. The U.S. "should encourage the Israeli government to do everything within the bounds of the practical, the moral, and the legal" to win. We need the Israelis to impose their will on their enemy, the Palestinians. The Palestinians need to accept the permanent existence of a Jewish state. The U.S. government should encourage the Israeli government to do everything within the bounds of the practical, the moral, and the legal to effect that victory. This doesn't mean murdering people but taking steps to compel Palestinians to give up, to cry uncle, to say, "The jig is up. We can't continue this. We need to coexist with our neighbor." At that point, liberated from their foul, irredentist goal of eliminating their neighbor, Palestinians can begin to build their own polity, economy, society and culture. Ironically, the Palestinians will win even more from their defeat than will the Israelis. Israelis won't get blown up on the way to the pizzeria, but they basically a good life economically, legally, culturally, and so forth. The Palestinians live in oppression and poverty. They can only leave that once they give up the monstrous goal of eliminating their enemy. "Ironically, the Palestinians will win even more from their defeat than will the Israelis." I've been brewing this idea for close to two decades. About a year ago, I went to my colleagues at the Middle East Forum and said, "Let's roll with this. Let's try to make this a campaign." I'm pleased to report that we now have 32 members of the House, a bipartisan group co-chaired by Ron DeSantis of Florida (who I'm sorry to note has left the room), Bill Johnson of Ohio, and Juan Vargas of California, and we're building all the time. We are building the political base. We now have 16 members in the Knesset Israel Victory Caucus coming from all six Zionist parties, opposition and government, every party but Meretz, the Arab Joint List and the Haredim. At the same time, we're also building an intellectual base, working with allies in think tanks, sponsoring research: what precisely does victory mean? How is it to be effected? What are the implications? "[A]fter [Palestinian] defeat ... talks will be productive; but until then, it's war and our side needs to win." We hope this campaign for Israeli victory will culminate, one day, with an American president saying, "Staff, this perpetual effort to bring Israelis and Palestinians together and get some result hasn't worked for 30 or 40 years. Is there another approach out there?" We want to be prepared with that other approach, one that which pushes negotiations aside as futile and counterproductive, and puts off negotiations until after defeat. Then talks will be productive; but until then, it's war and our side needs to win. Daniel Pipes: Historically, the American way of war is to destroy the enemy, leaving him without hope. And that model works. That's not been the case since World War II, however. That's what will work here - not talking to Mahmoud Abbas, Saeb Erekat, and all these clowns. It's time to push them aside in favor of an Israeli victory. Audience Member: It's wonderful if we can get our country, our Congress, and possibly our administration to understand the need for an Israeli victory; but what about all the money coming from Europe, the UN, and all those other institutions that are propping them up financially? Daniel Pipes: Yes, as I just mentioned, Islamic doctrine is one major cause of Palestinian illusion. A second major cause is what I call international succor: diplomatic support, money, UN resolutions, and on and on and on, which give the Palestinians the hope that one day they will prevail. U.S. 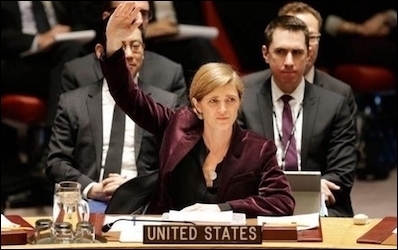 Ambassador Samantha Power votes on UNSC Resolution 2334: A year later, what good does it do Palestinians? There's not much we can do about that support; but when push comes to shove, if you're a Palestinian, resolutions voted on in New York are less important than what you're actually facing in your own circumstances. So, while international succor is important, it's less important than what Israelis do on the ground. Daniel Pipes: I did not use the word "bloodless." What I meant to say is this approach is not necessarily primarily military. To influence an adversary to give up, you can use all sorts of indirect means. 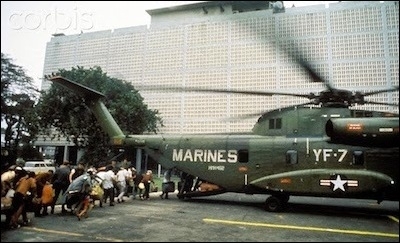 Civilian evacuees board a US Marine helicopter inside the American embassy compound in Saigon on the last day of the Vietnam War, April 30th 1975. For example, this country's greatest defeat was in 1975 in Vietnam. We didn't lose because we ran out of bullets or soldiers or dollars; we ran out of will. And we ran out of will because there were so many Americans avidly against continuing the war. That was indirect: we lost not on the battlefield but in the political arena. Likewise, when the United States and perhaps other governments, say to the Israelis, "Go ahead. Win your war," a whole range of policies exist that the Israelis can adopt, some of which will be military to be sure, but it's far broader than military. Take, for example, the Israeli policy towards Gaza. You might respond, "What policy towards Gaza?" and that's my point. It's inchoate. It's moving from one brushfire to another. My advice to the Israelis would be, "Assuming your goal is to convince the Palestinians to give up, figure out the strategy and tactics to achieve that aim." In some cases that might involve military action, to be sure, but it's not primarily or limited to military. It's a broad approach but I do not think it appropriate for me, here and now, to get into details. I might add that we're also not talking about what comes after defeat, where the borders are; how many, or if any, Palestinian states should exist; who controls what in Jerusalem; and so on. We are just advocating an approach: instead of peace processing or what I call "war processing," achieve victory. "The Palestinians must understand that their 100-year war on Zionism has failed." And by the way, it's in that context that we can move the embassy to Jerusalem. So long as it's merely a matter of bureaucratic neat-keeping, because all our embassies are in capitals and this one isn't, it's not going to happen, will never happen. But once it's put into the context of sending a signal to the Palestinians that we are standing with Israel and that they should forget trying to break this bond, then moving the embassy to Jerusalem will send a message, be meaningful, and be worth the trouble.